A hand painted needlepoint canvas (18 count) by Pat Thode comes with a stitch guide giving thread and stitch suggestions. (If it needs to be ordered, please allow 2-3 weeks to arrive.) 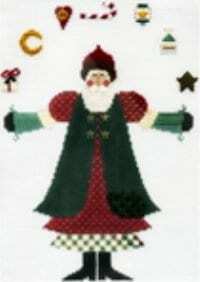 This Santa is dressed in a red and green outfit and has a variety of Christmas objects in the air over his head. Also includes a brass star charm for embellishment.